Textured Jewelry - This is a handcrafted pendant created from contrasting silver texture and tubes that frame an oval black and grey Orthoceras fossil from Morocco (35mm x 15mm). This One-of-a-Kind necklace comes with an 18" sterling silver snake chain. This is a modern statement necklace created from hand-formed sterling silver textured "ribbon" and sterling silver tubes soldered together. 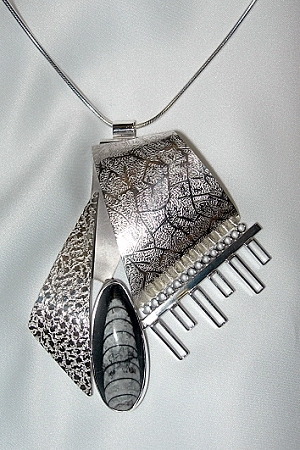 The abstract design is accented by an Orthoceras fossil. The four hundred million year old Moroccan fossil is fully bezeled in sterling silver. The organic pendant comes with an 18" sterling silver snake chain. This unique pendant measures 3.2" long x 2.7" wide. The Orthoceras fossil is 1.4" long x .6" wide (35mm x 15mm). The pendant includes an 18" sterling silver snake chain. The clasp is a lobster clasp. Designed, signed, and handmade by Aaron Rubinstein and Modern Art Jewelry .